On the third Tuesday Christina or Christy Ewers Tugeau of the Catugeau Artist Agency will answer questions and talk about things illustrators need to know to further their career. It could be a question about an illustration you are working on, too. Please email your questions to me and put ASK CAT in the subject box. Here we are half way through summer already! and Fall and our ‘new school year’ beginning is fast approaching. So we want to use this time to sharpen up our skills, refresh the portfolio, and make a Business Plan for autumn. Part of that BIZ PLAN is trying to make up our budget for income and expenses looking to the new year. We got 2 great questions along these lines, both probably on MOST artists minds, but not sure they should ask. ASK! 2.) Are there average payment amounts – some “guide” to give an idea as to what to expect as an unestablished illustrator. These are a number of questions actually. I believe the overall question is ‘how is the COMPENSATION PRICE determined generally’ A big topic, as it depends on so many things as indicated here. First is what market is it? and I will then try to give you an idea of ‘typical’ pricing. Do check with the Graphic Artists Guide Pricing Book….fair resource. And the SCBWI THE BOOK also goes into a lot of these issues. The prices for educational work have not gone UP in over 20 years! The industry all but vanished just before the ‘crash’ in 2008 and hasn’t come back like it was at all. But they still need new illustrations especially for the reading programs…new manuscripts = new art. The pieces are priced by size…1/4 page ($150+), 1/3, 1/2 page ($250+) , 3/4, full page ($500 if you are lucky) and spreads – one image on double pages ($500++) Be sure a KILL FEE is in the contract (50% at sketch, 100% at finish if no fault of artist) Also there should be “AA” fees (stands for Authors Alterations) ….where they pay you more if they ask MORE of you…or change something after sketches were approved. we negotiate at $75 an hr. If it’s educational book publisher (these can be imprints of trade houses, or more “mass market” publishers) it well might be billed as a total ‘Flat Fee’,( may or may not be WFH…ask) depending on number of pages, complexity, size, and deadline time again. These books do pay less than trade and vary a lot. I will guesstimate from $2500-5000 or more or less, depending on the publisher size and the distribution expected etc. SO HARD TO SAY. Some trade projects (board books, novelty books, elementary and middle grade chapter books) will be flat fee or smaller royalty if any. it’s the pricing point mostly that determines this of course on their end. Often if a series does well, you can negotiate for a royalty later. As to compensation on PICTURE BOOKS… WOW! We have 32 page picture books done for $5000 (rarely as we hate to take our agency commission on that price) or over $25,000. Probably an average price for us is $8000-$15,000. Ideally the realistic oil painter should be paid more! But that might not be the case again because of size of publisher, and how established an artist is. A more well known and sought after artist will of course be negotiated higher than a ‘first timer’, or less well established artist. And they might have to wait for him or her! But here is where the artist’s Sales Record can come into play. If the books an artist has illustrated do NOT sell well, this can really hurt even a more established artist. This is why huge advances aren’t always the way to go oddly. If the advance isn’t ‘earned out’ the sales record looks bad!! hmmm. I’ve thrown a lot at you all here. Maybe come more questions will pop up! Happy summer and Fall refreshing! New adventures ahead…..
Do send on more questions about our wonderful industry!! Christina A. Tugeau Artist Agency LLC is the first mother/daughter agency in the business! A trained artist herself with a BA in Fine Art, Chris Tugeau has been in the children’s illustration industry for over 25 years. Since opening her own agency in 1994, Chris has enjoyed representing many talented artists, and has been an active part of the illustration community; writing and presenting for SCBWI regions around the country. She is also the author of SCBWI Illustrator Guidelines. A veteran artist and rep, Chris is an advocate for ethical fairness and the bright future of children’s publishing. She’s also a mother of 3, a grandmother to 8, and best friend to husband, Bill. Chris and Christy, Thank you for taking the time out of your busy schedule to answer questions and helping everyone trying to build their careers in the children’s publishing industry. This was a terrific questions and a terrific answer. – Great article. Please help keep this column going by sending in your questions. Thank you Chris and Christy for more great answers. Hope this illustration by Nina Mata will inspire everyone to send in a question to Chris and Christy. 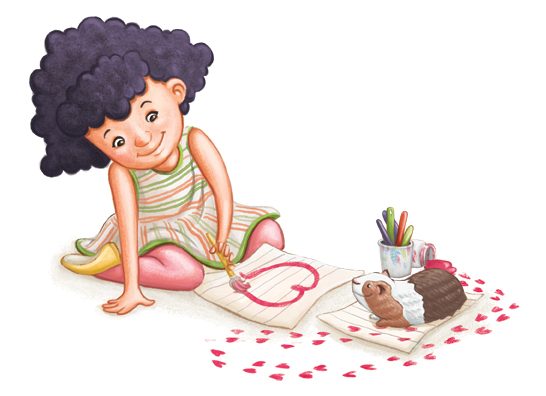 Nina was featured on Illustrator Saturday March 3, 2012. Take a look. Thank you, this is always a tricky subject for me. The info is very useful!